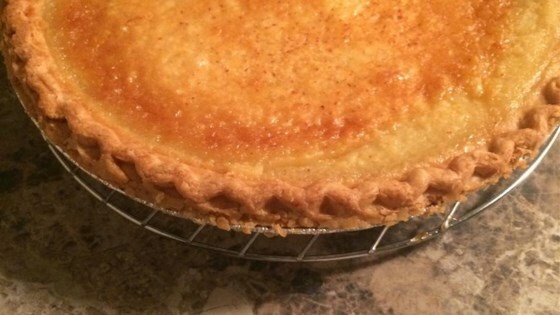 "If you have ever had a traditional Buttermilk Pie then you will love this pie with its holiday twist! You can also add a splash of brandy or brandy extract for a little kick." Mix the sugar and flour together in a mixing bowl. Beat in the eggnog, eggs, and vanilla to make a smooth mixture. Stir in the butter. Pour into the prepared pie crust. Bake in preheated oven until the custard is set, 35 to 40 minutes. Cool before serving. I made this just the way the recipe said to, and it was wonderful. I took it for Christmas dinner and received a ton of compliments. It tasted just like eggnog! I got rave reviews for this pie! It does have to cook longer...almost an hour total I think.